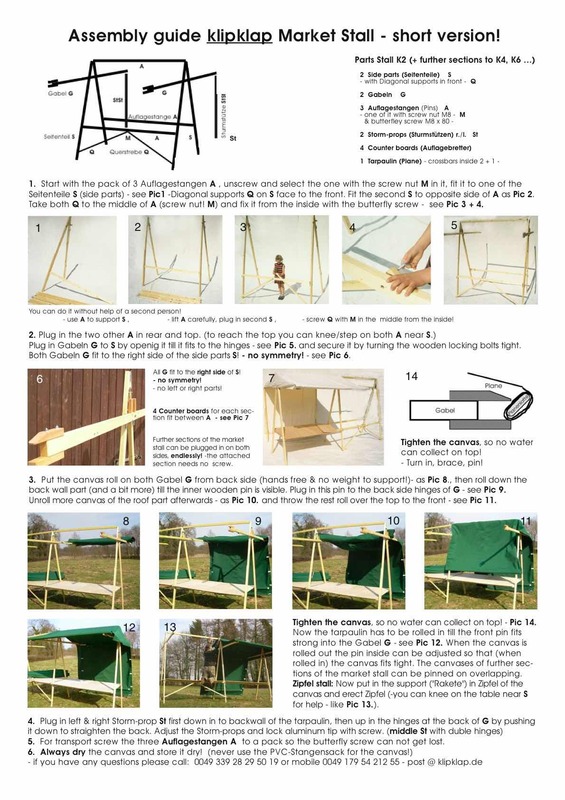 PS: You can print this assembly guide ( PDF ca. 200 KB)! 2.) How can I clean the canvas? Once dried, the canvas maybe brushed off to remove dust and soil. Water without soap will help to remove deeper stains in the fabric (using a high pressure cleaner if available). Chemical cleaning products should not be used, as they will damage the waterproofing of the canvas. As a result, some discolouration may remain after cleaning, which can only be prevented by save handling during transport and set up (always use supplied bag). Some darkening in colour due to ageing is normal, but maybe counteracted by long sun exposure, which may also bleach out discolourations. Professional chemical cleaning and subsequent waterproofing is not recommended. Experience has shown that the new waterproofing is not satisfactory, is often as expensive as half the price of the new canvas, and the canvas may shrink as a result. Preventing stains is often your best, easiest and cheapest option to care for the canvas, which is undoubtedly the most important (and most expensive) part of the stall.